First response by OWAIN JONES of the Countryside and Community Research Institute, co-author of Tree Cultures: The Place of Trees and Trees in Their Place (2002); second response by PETER LARKIN, New forest-born essayist, philosophy librarian, and poet (Three Forest Conformities, 1997) whose work is most extensively collected in Terrain Seed Scarcity (2001) and Leaves of Field (2006). What is this terrain? If a forest, what kind, and where located? Is this the terrain under the living canopy? What we have is a density of patterning. 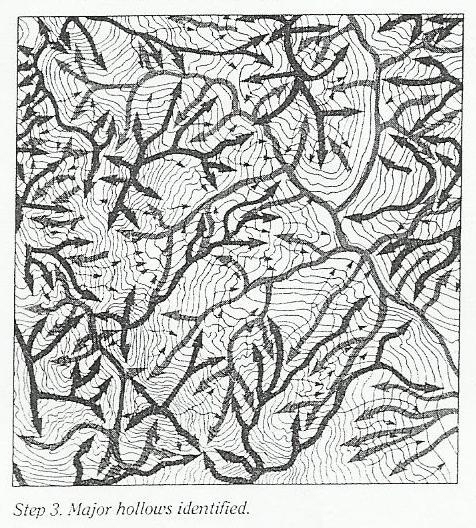 Contours – which have that alluring graphic characteristic of being almost parallel, aping the line each side, but swelling or diverging in places, step by step, to show a swelling bluff, or beginnings of rill growing to gully. Steepness by closeness, twisting ridges and valleys: there is not much flat ground here. Tempting to think of this as the shape below the forest and its canopy – but of course the two are one really. Systems of systems of interdependencies. Water follows inclines, making its own route-ways over time. I assume the arrows show water flow in order to indicate hollows and the complexity of the catchment areas in what is an obviously mountainous terrain. We have a topographical pattern of the contours – (two mountains? mid bottom left, mid top right) and a series of interconnecting ridges and valleys. The flow diagrams are more directional (obviously – the arrow heads) so speak of temporality, of cascade, a pattern on a pattern. It is a beautiful image, a sort of moiré effect of process across process (running in differing temporal registers), an ecology of time and pattern. This speaks of how complexly ground is patterned (Harrison et al 2004) once it is attended to closely. It also speaks to rhythm, in the flows that follow the terrain in seasonal patterns. Together we have what I have termed rhythmpattern (Jones 2011), in which the rhythmic patterning of time needs to be conjoined with the patterning rhythms of space to produce ongoing processes of place. This could almost be animal pelt (but not quite): the print of nature echoing and echoing through forms and scales and processes. I doubt it is wilderness (Cronon, 1996). But it will be alive with the agencies of nature and the geographic adventures of a host of non-human personhood. Some of the flow lines traverse the image like a route-way. Is this the way one would walk, or ride, through this terrain, along the valleys and streams? Some flow-lines seemingly interconnect, almost whole catchments that link by one filament; others do form discrete isolated networks/catchments (mid top left), private places for human and non-human alike. This is a place to get lost in. Either scarily so – as in the forests of the fairy tales and fantasies (think Stevie Smith’s poem Fairy Story), or in backwoods horror (think Deliverance). Or as a retreat from modernity (Thoreau 1972); as escape from state authority to the English greenwood (Schama 1995); as a place of entrenched resistance, a death trap for ill-advised military ventures; or as a place for experimental living (The Republic of Trees by Sam Taylor). The enigmatic drawing speaks of detailed, fieldwork based science, where close observation on the ground is used to build up detailed diagrammatic narratives of landscape and processes therein. But it also speaks of passion and love of place – topophilia (Tuan 1974); perhaps obsessive belonging through study. Often such approaches are held in opposition, and sometimes rightly, but in many other instances, science, fieldwork and love of place come together most productively. See, for example, Bernd Heinrich’s The Tree in My Forest. Here the ground is paid the closest attention, as in the counting of 80 tiny tree saplings per square foot (Hemlock, Balsam Fir, Red Spruce, Birch, Spruce, Red Maple). A grass of infant trees out of which, through best adaptability to that particular micro space and time, one would eventually flourish. A diversity of trees and biodiversity depending on the orientations and angle of slope, exposure to wind and light, grazing animals, the salts in the soil. This could be the basis of a deep map (Heat-Moon 1991) – it should be. We need more deep maps. Is it old growth forest – tropical, temperate? It looks too rugged to be plantation. Has it been logged, or does it grow over derelict military infrastructure or ancient temples? (Kaza 1993). I hope, and feel, it was created by an “attentive heart” (Kaza again), but maybe it was made with a colonial eye, or commercial, or military. Has it been clear felled to leave the slopes open to erosion and the community life of the canopy and forest floor displaced? Or is it the territory of Buck and the wolf pack he joins (Jack London The Call of the Wild), which has its ghost wolf in the sacred forest space the Indian tribe steer clear of? Whichever, it will be a place of narratives, both human and non-human, local as can be, but woven out of and into the processes of the forested landscape. Cronon W (ed) (1996) Uncommon Ground: Rethinking the Human Place in Nature. Norton, New York. Harrison R P (1992) Forests: The Shadow of Civilisation. University of Chicago Press, Chicago. Heinrich B (1997) The Trees in My Forest. HarperCollins, New York. Heat-Moon W L (1991) Prairy Earth: a deep map. Andre Duutch, London. Jones O., (2011) Lunar-solar ryhthmpatterns: towards the material cultures of tides, Environment and Planning A, 43, 2285-2303. Kaza, S. (1993) The Attentive Heart: Conservations with Trees, Boston: Shambhala. Schama S (1995) Landscape and Memory. HarperCollins, London. Smith S (2001) Fairy Story, in M. Sweeny (ed) The New Faber Book of Children’s Poetry, London Faber and Faber, p 254. Thoreau D H (1972) In the Maine Woods (ed. J.J. Moldenhauer). Princeton University Press, Princeton. Tuan Y F (1974) Topophilia: a study of environmental perception, attitudes, and values. Prentice-Hall, Englewood Cliffs.